We started a contest on our Instagram, Facebook and Twitter pages asking you to share the cutest photo of your sighthound wearing our product. Zoey is a Five-year-old Fawn and White Italian Greyhound living in Nashville, United States. We want to Thank Everyone that entered. Even though there can only be One Winner, We also have some photos that were just too good not to share. We also thought we would join in the fun and share some of our Favourite photos over the year! 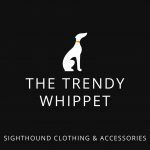 You can also see loads of other Sighthounds enjoying our products if you head over to our 'Happy Customers' page on our website.